FORT WORTH, Texas (May 10, 2012) – Baird Private Wealth Management, in association with Colonial Country Club, The Friends of Golf (FOG) and the Golf Coaches Association of America (GCAA), has announced that sophomore Patrick Cantlay (UCLA), freshman Patrick Rodgers (Stanford) and freshman Jordan Spieth (Texas) are the three finalists for the 2012 The Ben Hogan Award. This is the youngest group of finalists in the award’s history. Only one freshman, Oklahoma State’s Rickie Fowler in 2008, has ever won The Ben Hogan Award, and no sophomore has ever been crowned. Cantlay, the world’s number one ranked amateur according to the World Amateur Golf Rankings and the Scratch Players World Amateur Rankings, is a finalist for the award for the second straight season. Last month, the sophomore from Los Alamitos, Calif., made the cut at the 2012 Masters and won the Silver Cup for finishing as the low amateur (T-47th). He also was the low amateur at the 2011 U.S. Open after tying for 21st place. The runner up at the 2011 U.S. Amateur Championship at Erin Hills, Cantlay played on the U.S. Walker Cup team last summer. During the collegiate season, the first-team All-Pac-12 selection secured four top-10 individual finishes for the Bruins, including a pair of runner-up showings. Rodgers, a native of Avon, Ind., is currently among the top four in all four major rankings systems: WAGR, Scratch Players, Golfweek/Sagarin and Golfstat. Last summer, he represented the United States at the 2011 Walker Cup, finished second at the Players Amateur, took fourth at the Northeast Amateur and reached the round of 16 at the U.S. Amateur. In his first collegiate season, Rodgers was named Pac-12 Freshman of the Year and first-team all-conference after earning eight top-10 finishes, including wins at the Fighting Illini Invitational and the Western Intercollegiate. He was also recently named to the United States team that will compete in the 2012 Palmer Cup at the Royal County Down Golf Club in Newcastle, Northern Ireland. Spieth, who hails from Dallas, Texas, is the nation’s top-ranked golfer in the Golfweek/Sagarin ratings as well as the Golfstat rankings. He was recently named the Big 12’s Player of the Year and Newcomer of the Year. The freshman captured three tournament wins and five additional top-six finishes in just nine events during his inaugural year at Texas. Last summer, Spieth reached the quarterfinals of the U.S. Amateur and the Western Amateur and also competed for the United States’ Walker Cup team. This April, he made the weekend at a PGA TOUR event, tying for 41st at the Valero Texas Open. He also competed in the Northern Trust Open in February, missing the cut by just two shots. The three finalists will attend a black-tie banquet at Colonial Country Club on Monday, May 21, where the winner will be crowned prior to the start of the PGA TOUR’s Crowne Plaza Invitational. The awards ceremony will air live on Golfweek TV on Golfweek.com beginning at 8 p.m. (CT). 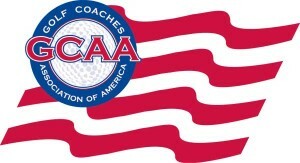 The winner’s university will receive a $20,000 grant to its men’s golf scholarship program while the other finalists’ schools will each receive $10,000 grants. In addition, the winner receives an exemption into the 2013 Crowne Plaza Invitational at Colonial. In addition to the above list of winners, the prestigious list of previous finalists includes current PGA TOUR players Bud Cauley, Anthony Kim, Spencer Levin, Graeme McDowell, Michael Thompson, Camilo Villegas and Nick Watney. For table and ticket information for the 2012 banquet, call (817) 927-4280. Individual tickets cost $250 and tables are available for $2,000 and up. Patrick Cantlay is a finalist for the second consecutive year, becoming the first player named in back-to-back years since Oklahoma State’s Rickie Fowler (2008, 2009). The only other golfer named multiple years since the paring down of three finalists in 2005 was Georgia’s Chris Kirk (2006, 2007). Including Rickie Fowler and Chris Kirk, six players have been named finalists multiple times, and all ultimately won The Ben Hogan Awards during their careers. Bill Haas (2002, 2003, 2004), Ryan Moore (2003, 2005), Hunter Mahan (2002, 2003) and D.J. Trahan (2002, 2003) each were finalists at least twice in years when the finalist list included more than three individuals. Prior to this season, just two freshmen had ever been named a finalist for The Ben Hogan Award: Oklahoma State’s Rickie Fowler in 2008 and UCLA’s Patrick Cantlay in 2011. The Big 12 Conference is represented by a finalist for the sixth time in the past seven years (2006, 2007, 2008, 2009, 2011, 2012) while the Pac-12 Conference has now had a finalist for three consecutive seasons and four times in the last five years (2008, 2010, 2011, 2012). The Pac-12 has two nominees, meaning that one conference has boasted multiple finalists three consecutive years (SEC, 2010; Big 12, 2011; Pac-12, 2012). Texas (Jordan Spieth) and Stanford (Patrick Rodgers) each boast a finalist for the first time since the award criteria was updated in 2002. 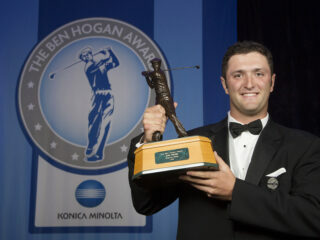 Texas is the only one of the three schools to have a Ben Hogan Award winner, as former Longhorn Jeff Fahrenbruch, a voter on the selection committee, won the award in 1997. This is just the second time that the award, based in Fort Worth, Texas, has a finalist playing for a university in the state of Texas (Chris Stroud, Lamar, 2005). The three finalists are the top three amateurs in the World Amateur Golf Rankings and comprise three of the top six spots in the Scratch Players World Amateur Rankings. In addition, the three are all among the top 10 in the Golfweek/Sagarin ratings and in the top 25 according to Golfstat.